Is this navigable in LOW tide from caxambas to **** key or Goodland without going through the slow zone ? I was stuck briefly a couple times today in high tide. My boat drafts in 2 feet. You can run on plane from **** Key all the way through the area above where it says Caxambas Bay. Caxambas has shoaled up a lot between channel marker R 8 and Dickmans Point. There is a channel to the south of the main channel that is navigable at low tide, but I don't know how much time would be saved going out one channel to get around the shoaling, and then coming back in through the other. Thanks Mr. Googan! Between dickmans pt and marker 8 leaves little room for error. It doesn’t seem enough water at high tide. I’ll go out at low tide and try to find it. Do you use any reference points on land to line yourself up with the channel ? There is plenty of room and you should be fine. I assume you have mapping GPS? The area between blind pass and helen key is shifting sand so that can get sketchy if you font know the area very well. 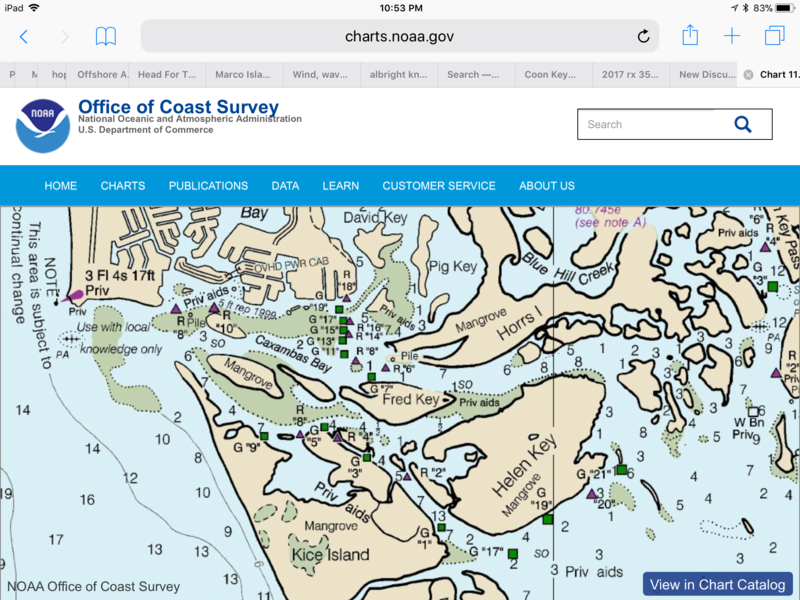 My Graph is an ‘06 and where it shows channel is mud in a few places especially as you come out of snook channel into dickmans pt. It’s frustrating for as many boats are in the south end of Marco, it should be marked better. Learning that "local knowledge necessary" can a PIA. I've been stuck trying to run behind Ramsey Key to Neal Key on a low tide in a flats boat. Fortunately, a bigger boat came close pushing a big wake and floated me off. Too bad for him though, he got stuck! But now I know where the channel is. "If it's not one thing, it's an alternator"
What kind of graph do you have? Garmin 441s. I’m starting to figure it out. I just need to learn some patience. Was out there Sunday from 7am till 11am, outgoing all morning. Was not sure if I could make it due west to the new cut, so went around the Marco Rocks and into Blind Pass. As I returned to the ramp via the inside passage, went through the "shoaled" area. Depthfinder showed 1.6 feet at the shallowest point. I'm running a heavy 19-foot bay boat. At a negative tide, would never try that. I've hit my skeg a few times going out with a 0-tide. Hate running all the way around the dome houses to Cape Romano but would rather be safe than sorry. My rig has shown 1.0 depth running, but the engine is fully trimmed out, with a wee bit of pucker factor......Anything a 0+ tide and I can make it with only minor concern. Not sure if this post is worth anything, just my .02. be safe.